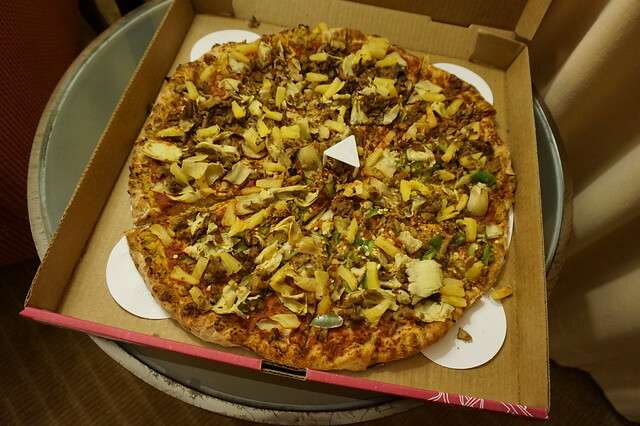 Minnesota – When Pizza is Exciting. – vegan in your city. Home Minnesota Minneapolis Minnesota – When Pizza is Exciting. We arrived in Minneapolis, Minnesota super late at night after driving up from Chicago, via Madison, Wisconsin. After a frenzied search for a hotel, while parked in the Mall of America parkade (we went to the Arizona level) having a hard time finding wireless signal, we eventually settled in for the night at one of my least favourite hotel chains. So, I’ll say I’m not usually excited about pizza. For me, it often turns into food for the sake of eating something, which I don’t like doing most of the time, but JC actually likes pizza, and found a pizza place I hadn’t heard of with lots of vegan options, and gave them a call: Pizza Luce. So I shrugged and said whatever. Well, I was wrong to not be excited, and probably tired, and hangry at the time, because this pizza was tasty, with a great crust. Another nice thing about Pizza Luce is that they also make their own nut based vegan cheese called Rinotta, that we got on our pizza. It’s not really like cheese, and sort of reminded me a tiny bit of Maniocheese, but it was nice to have a daiya and dairy alternative to try. They do delivery, but JC went and picked up. On their website you can organize things by “vegan or vegan by request” (and also by gluten free or gluten free by request” if that’s your scene) In addition to pizzas they also had hoagies (the Mock Muffeletta sounded interesting), pasta, and salads. They also had a variety of vegan friendly desserts – JC brought back a fudgey vegan brownie, but after spending a lot of time in saran wrap it was too ugly to photograph. 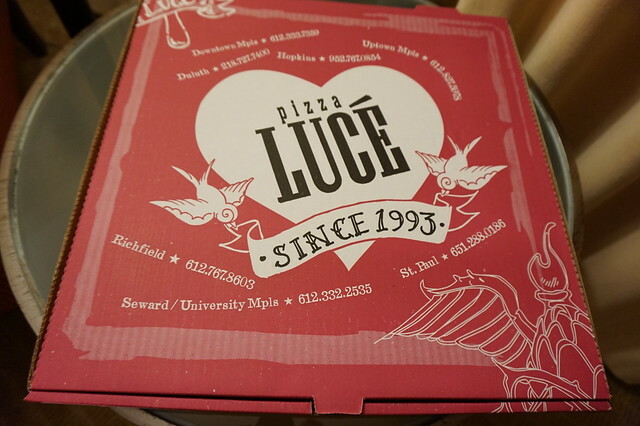 While Pizza Luce wouldn’t necessarily have been my first choice for eating in Minneapolis, heck a pal even has a website showing off some of the Minnesota Vegan eats she finds, and it’s clear there really are a variety of options available (including other late night spots like Hard Times Cafe) this Pizza was great for taking home and eating at 2 am. 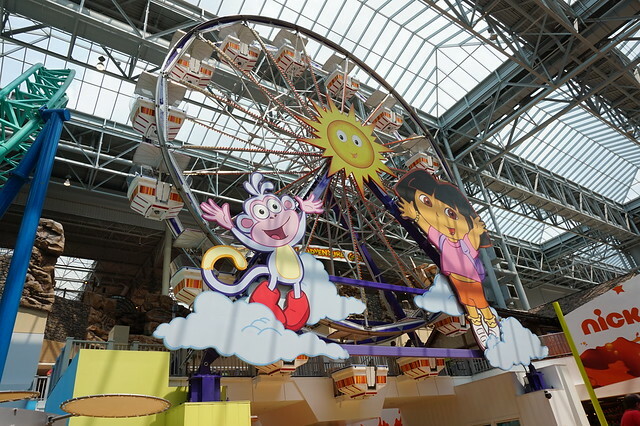 The next morning we planned to go to Hard Times Cafe for breakfast, but first we had to pay a very quick visit to… the Mall Of America… since it wouldn’t have been much of a story if our only visit there consisted of sitting in the parkade looking for hotels. But turns out, it’s not much of a story either way. I was interested in seeing the Mall of America because growing up in Edmonton, I lived near West Edmonton Mall. And while some people took it as a point of pride that we had the biggest mall in North America… some of us (me) were not nearly so excited by that. Either way, I had to see how USA’s massive mall compared to WEM, and JC wanted to buy himself a shiny new phone only released in the USA at the time. I also got a picture with a giant Dora the Explorer statue. We both got what we wanted! Any tips on other really tasty vegan places in Minneapolis? Minneapolis, pizza, pizza luce. Bookmark. Pingback: Minnesota – Hard Times Cafe | meshell in your city. I always enjoy hitting up Pizza Luce when I’m in Minneapolis. I think their rinotta is really tasty, and I appreciate when a restaurant offers a house made vegan cheese instead of relying on Daiya. Other places I like to visit in Minneapolis are Ethique Nouveau, a really cute vegan shop, Jasmine 26 for Vietnamese food, Midtown Global market for foodie-style shopping, and Ecopolitan for raw cuisine. Hah! It doesn’t even sound real!!! that’s awesome. Yum! I love pineapple on pizza! How cool that they make their own vegan cheese!